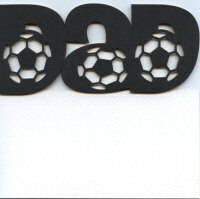 Cut and shaped white textured card blank with black cut out ""football"" letters for layering. Approx 144mm square. With white envelope. Kit to make 1 card.